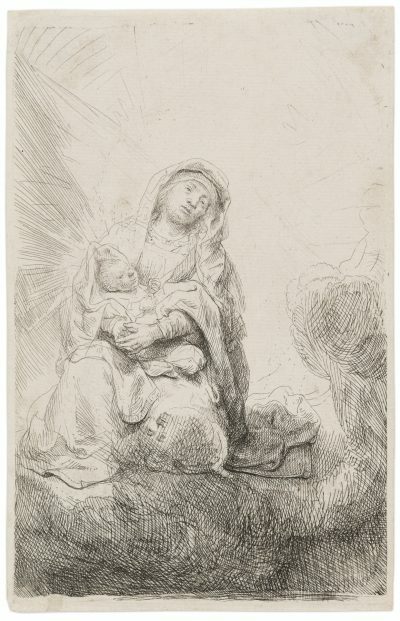 Signed and dated in the plate lower right Rembrandt f. 1641. A superb 17th century/lifetime impression of Bartsch, Hind, Biorklund/Barnard, Usticke and New Hollstein’s only state of this rare etching (characterized by G.W. Nowell-Usticke in his 1967 catalogue Rembrandt’s Etchings: States and Values as “very uncommon: a popular subject” and assigned his scarcity rating of “R-” [75 to 125 impressions extant in that year]), with the sulphur tinting at the left and the craquelure in the sky in the center printing clearly. Catalog: Bartsch 233; Hind 179; Biorklund-Barnard 41-C; Usticke 233; New Hollstein 200. This etching shows the so-called Little Stink Mill on the De Passeerde bulwark at the southern extremity of the wall that ran down the west side of Amsterdam. Looking back along the wall in a northerly direction, Rembrandt would have seen the windmill on his right (this is reversed in the printing process), with cottages beyond it, all standing just within the earthen city wall that encloses the bulwark. In the distance two figures stand on the next bulwark to the north, where stood another, larger windmill, known as the Large Stink Mill. Both were tower mills owned by the Leathermaker’s Guild and were active softening tanned leather by treating it with cod liver oil – hence the names attached to them. The windmill is depicted in great detail. The tower mill type allowed the cap and sails to turn independently of the main body, a more efficient method of keeping the sails to the wind than the traditional post mill, the whole structure of which rotated. Rembrandt describes he wooden platform around the body of the windmill and the three long tailpoles attached to the cap. The latter converge near the wheel that help to keep the mill turned to the wind. The rope descending from the horizontal post behind the cap operated a brake on the mill’s main axis. Below the cap, the main body of the structure would have been made of brick with a wooden cladding, into which the doors were set. These could be reached only by ladders, and Rembrandt has included a figure with a sack over his shoulder about to mount one of these. The sails of the mill are furled and in fact face away from the prevailing westerly winds. The exceptionally detailed description suggests that Rembrandt worked on the plate on site. The nearby cottage is represented with equal exactitude. Rembrandt’s plein-air drawings, including the drawing he made of the same windmill, but seen from the north, are normally far less precise, and would not have supplied sufficient visual information to produce the print. 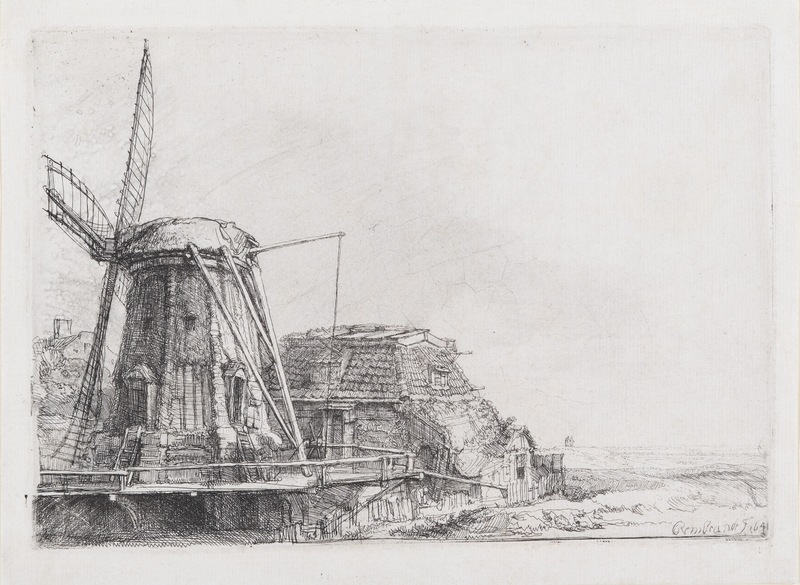 The etching also prompts us to ask why he should choose to focus on a windmill and why, of all the mills in Amsterdam, Rembrandt chose to represent the Little Stink Mill, one of the least prepossessing and which stood almost as far from his home in the Breestraat as it was possible for him to travel without leaving the city? His choice of motif is certainly idiosyncratic, and perhaps the traditional view of Rembrandt as a rebel against ideal beauty is nearer the mark than is sometimes currently allowed. “The Windmill” is one of two landscape etchings dated 1641 in which Rembrandt employed his mysterious granular bitten tone to evoke a misty grey atmosphere. Brushy marks are visible in the sky as well as crackle patterns resulting from the cracking of the etching ground or perhaps of the layer of corrosive paste that Rembrandt may have applied to the plate in order to achieve this fine etched tone. As he did with other etchings, Rembrandt carefully burnished away the grey bitten tone in certain areas, such as the diagonal struts of the mill, in order to create bright highlights. The artist’s early biographers reported that he was the son of a miller and that his full name was Rembrandt van Rijn. This must have been the background to the fact that in the early eighteenth century this etching was known as “Catwijk op Rhijn, de Geboorteplaats van Rembrandt” (Katwijk on Rhine, the Birthplace of Rembrandt). This tradition persisted well into the nineteenth century, until Fritz Lugt in 1915 confirmed its identification as the Little Stink Mill.